Explore “the Land of Kings” and discover the majesty of Rajasthan! Travel from Mumbai to Delhi through Rajasthan over 14 days with this tour package and experience all of the treasures and charm this region has to offer. In cities like Agra, you will not only see the Taj Mahal, but also visit a local market and learn how people live. In Udaipur we will also take a bycicle ride around the lake. In addition to learning about the local culture, we will visit all the must-see palaces and forts. Whether its exploring big, bustling cities or small, rural villages, discovering local delicacies, wandering maze-like bazaars, experiencing life in the desert, or marveling at ancient forts—Rajasthan truly has it all. Arrive in Mumbai. Sightseeing in the city on Day 2. Arrive in Mumbai check into the hotel. There are no activities this day, so enjoy exploring the city on your own. In the evening, your guide will come to greet you and the rest of the group in the hotel lobby. Over a welcome dinner, your guide will go over the itinerary for the next 13 action-packed days! 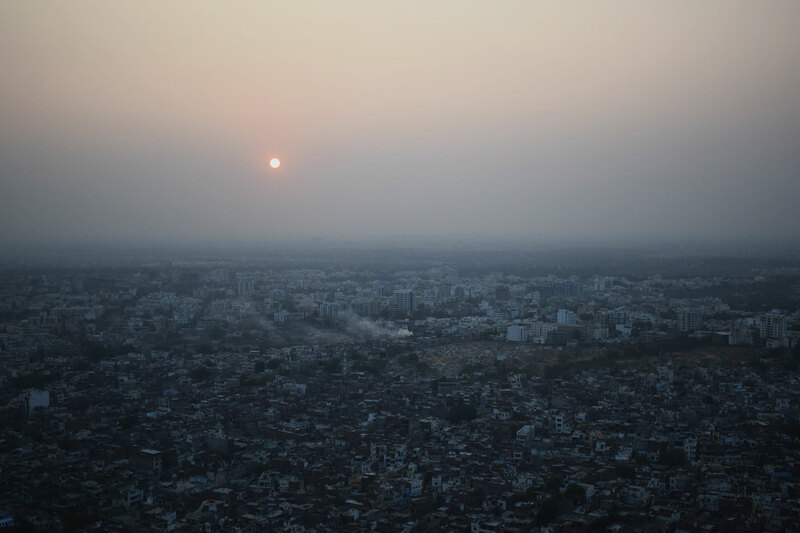 On Day 2 we will travel together to Dharavi, one of Asia’s biggest slums and the heart of small-scale industry in Mumbai. 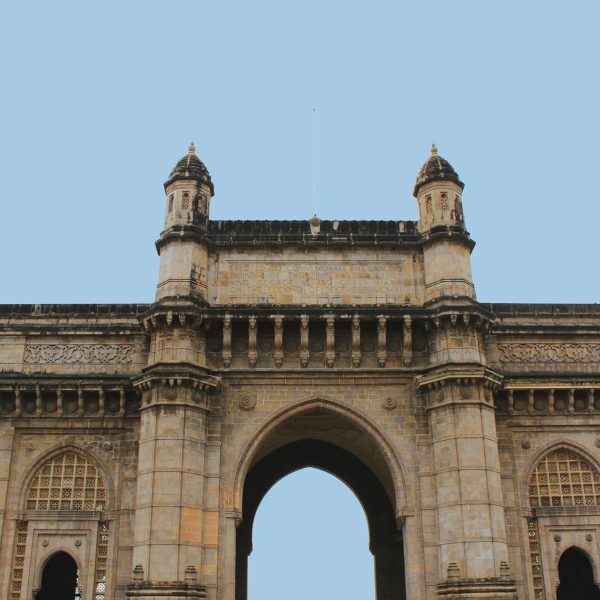 The tour of Dharavi, our company’s award-winning and signature tour, shows a balanced portrayal of life for the less privileged in Mumbai and you will learn about the NGO programs directly supported by the visit. The rest of the day will allow time for some sightseeing or additional tour options. Morning flight to Udaipur on Day 3. Optional orientation walk of the city. Udaipur, also known as the City of Lakes, is one of India’s most picturesque cities. During our stay, we will visit the iconic City Palace and enjoy the sweeping views from the island palace and many treasures housed inside. You will also have the options of watching the sunset from one of Udaipur’s many rooftop bars or a dance performance at Bagore Ki Haveli in the evening. You can also learn how to cook real Indian masala chai, pakora, chapattis, and curry or you can spend your time wandering around the hilly streets and alleys checking out the many painting studios and shops. The best way to discover Udaipur is by bicycle, and during your last afternoon in Udaipur we will cycle around a lake towards the northern side of town. After our bike ride, we will visit our friend Jameer, a local driver and enjoy a dinner with his family. Travel by van to Ranakpur, home of an ancient Jain temple. Continue on to Kumbhalgarh Fort. Today we’ll travel from Udaipur to Jodphur, stopping at a couple of the region’s true highlights along the way. Around midday, we’ll arrive at the incredible Chaumukha Mandir, a Jain temple in the village of Ranakpur. This temple, built in 1437 CE, is comprised of over 1,444 intricate marble pillars (and no two are alike!). After visiting the temple, we’ll head towards Kumbhalgarh. The impressive Kumbhalgarh Fort was built in the 15th century and houses over 350 temples within its walls. The fort is particularly spectacular during the evening when lit up. We’ll enjoy the view before continuing on to Jodhpur arriving in the late evening in time to settle into our hotel and enjoy a dinner with the view of the old city in front of us! This morning is free for you to explore. Jodphur is known as the “Blue City” owing to the many blue houses. Explore Mehrangarh Fort, one of the largest in India, and Sadar Bazaar, one of the oldest markets in India. In the afternoon, we’ll hop in a jeep and head off to the Thar desert for a sunset camel ride and dinner with a local family. Morning train to Jaipur, visit to the Amber Fort. We’ll travel by train from the Blue City to the Pink City and will reach the capital of Rajasthan just before midday. Like most Indian cities, Jaipur is chaotic and crowded, though with patience, you’ll come to admire its forts, palaces, and bazaars. You’ll have this afternoon free to explore whatever you’d like, with your guide’s help. On your second day in Jaipur, you’ll visit the magnificent Amber Fort as a group. 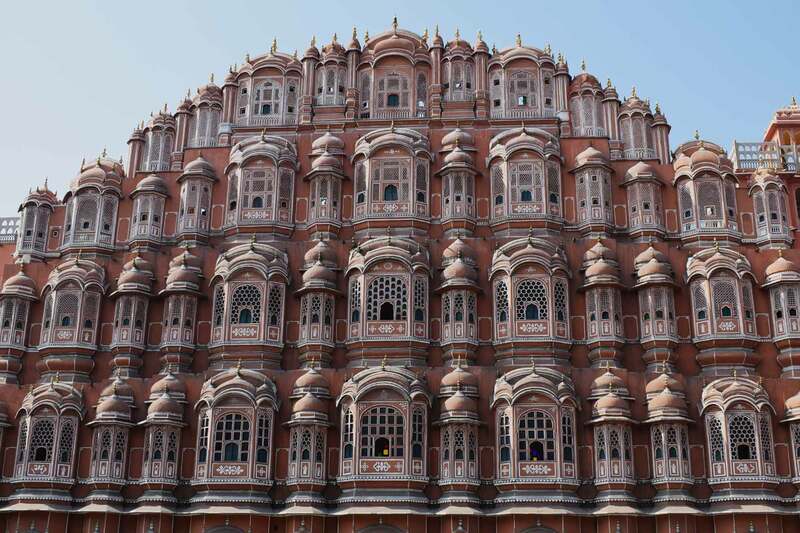 After visiting the fort, you’ll have the rest of the afternoon to continue to explore Jaipur. You may want visit the Hawa Mahal, City Palace, do some more shopping, or check out a Bollywood film at the famous Raj Mandir cinema. Morning train to Agra, visit the far side of the river. Arriving mid-morning by train, we’ll save the Taj for Day 10, when we can enjoy it during sunrise. Today we’re going to explore the far side of the river. On the way to the other side of river, we’ll pick our way through the busiest and oldest market in Agra on cycle rickshaw. The craziness of the market will envelop your rickshaw and you will have a great vantage point to take it all in. 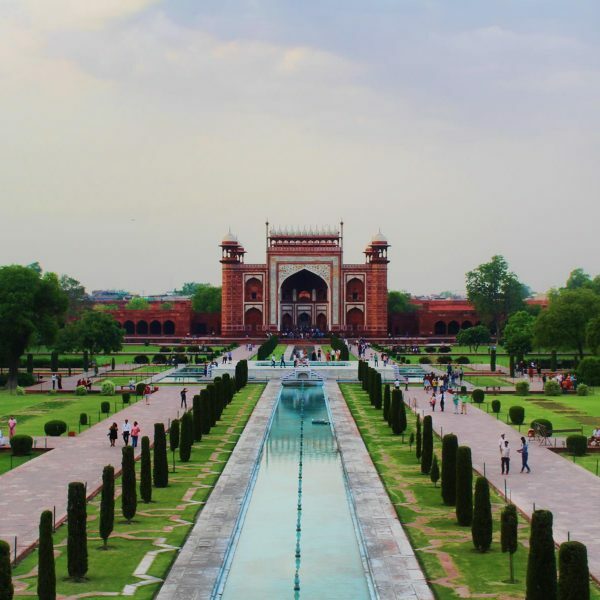 Then we will arrive at our destination: Mehtab Bagh, a small 22 acre Charbagh (Persian-style) garden directly opposite the Taj Mahal. 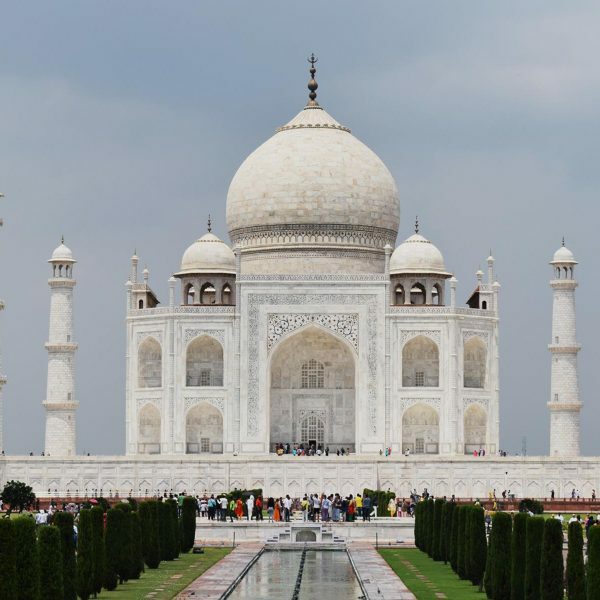 It is aligned with the Taj because legend has it that Shah Jahan also planned on building a black marble mausoleum to mirror the white one. Whether the legend of this garden is true or not, the garden offers a very unique view of the mausoleum that did get built. The next morning we’ll wake up early and go see the Taj Mahal at sunrise. After the Taj, you’ll have plenty more free time to explore Agra before catching the train to Delhi. Agra is also home to the impressive, 94-acre Agra Fort that, although often overshadowed by the Taj, is definitely worth a visit. In the afternoon we’ll make our way to Delhi airport where we’ll catch a flight to Varanasi. Having arrived in Varanasi at the end of day 10, on day 11 we will visit the much famed Vishwanath Temple and enjoy a walking orientation tour of the city. In the evening we’ll attend one of the famous evening puja (prayer) ceremonies on the Ganges. We will receive incense blessings and set flowers and candles afloat on the Ganges as an offering to the gods. The following day is free for you to explore the bustling holy town. Visit Vishwanath Temple, Varanasi’s most famous temple, wake up early for a magical sunrise boat ride, take a day trip to Singhpur, said to be the origin of Buddishm and where the Buddha delivered his fist sermon, visit Ramnagar Fort, go shopping at Varanasi market, famous for silk saris and ornate jewels, or simply take stroll along the ghats and soak in the atmophere. Having sampled all the major sights of this mesmeric city we’ll head for India’s capital and our final stop, Delhi. 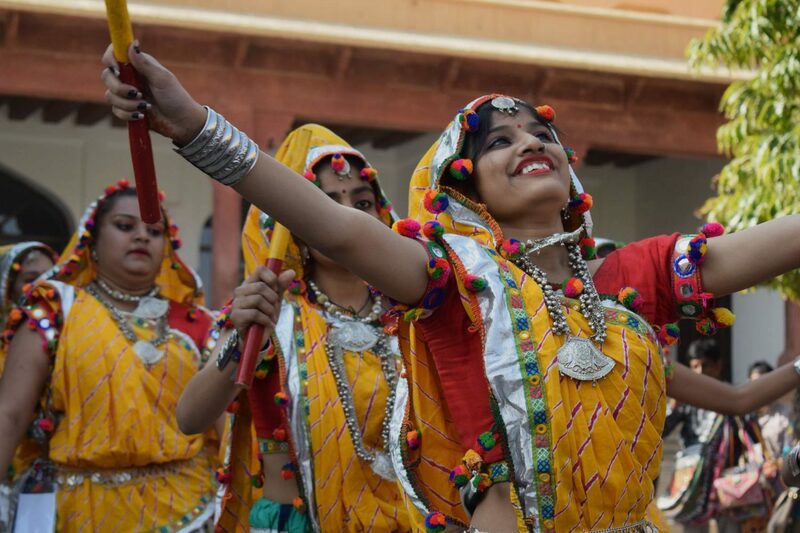 Marvel at the swirling colours of a traditional Rajasthani dance, soak in the exotic sights and smells of a local market, and take a relaxing cycle ride to a nearby village. We will end the day with a delicious rooftop dinner overlooking the romantic Udaipur lake. Climb up onto a camel and ride off into the desert for the evening. We will enjoy a local dinner with a camel herder family as well as a desert sunset over Thar Desert before heading back to town for the night. This is India’s religious capital. Spend time by the quiet waters of the ganges, visit the many ghats, walk through the narrow serpentine alleys of the city and enjoy the mystical experience that this city has to offer. Climb the hills to the stunning Amber Fort outside of Jaipur. Whether it’s the imposing architecture of the exterior, the intricate, delicate art of the interior, or the rich historical tales, you are sure to find something that fascinates you at this famous Rajasthani Fort. Gape in awe at the Taj Mahal at sunrise. Spend some time wandering around the courtyard, taking in the architecture, history, and refined beauty of this world-famous mausoleum. No words can describe how incredible the Rajasthan Unlimited tour was! Having traveled extensively, both independently and with other adventure tour groups, Reality Tours really do deliver what they promise. I walked away having felt like I experienced the “real” India, not as a tourist getting on and off mini-buses, but as an individual wanting to drink in every bit of an amazing country. An experience I will never forget. This was more than a holiday, it was an experience, much of which I will not forget, as it was so thought provoking. Unless you have been to this part of the world, it is difficult to describe in words the sights, smells and sounds that you encounter. Krishna was a fantastic guide with the patience of a saint. His knowledge, insights and the friendships he makes with all around him must make him one of the best people to show you the ‘real’ India. I felt privileged to have seen the slums in Mumbai, we were made welcome by some of the poorest people and the ways in which livings were being made was humbling. It is good to know that they are financing education and working with the people to try and improve the lives of people living here. There were so many highlights, sharing a meal with a lovely Indian family in their home, seeing the Bollywood movie in an Indian cinema and watching one being made from a rooftop in Agra! If you relish the thought of the unexpected and want to see some authentic Indian life, this tour is for you. We saw the real India and had a wonderful guide who knew the area well and took us to places and restaurants that we wouldn’t have visited by ourselves. 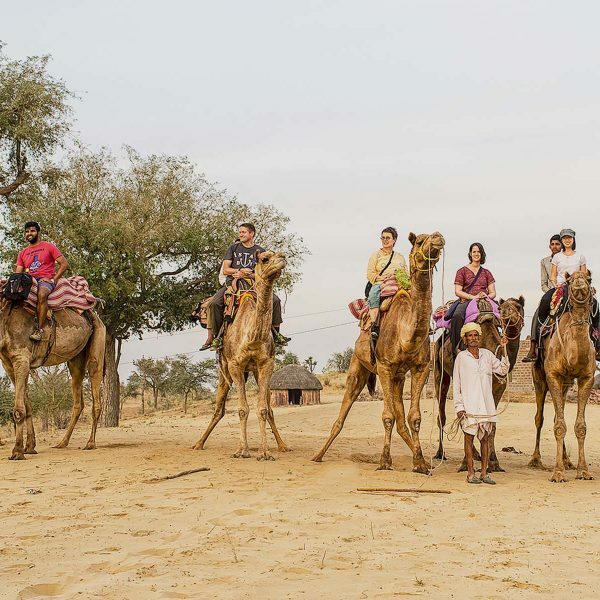 We had so many diverse experiences as well as seeing the sights, bike-riding, camel trekking, train travel, rickshaw travel (4 people plus our luggage in 1 rickshaw is still very memorable!). We watched a Bollywood film in an amazing cinema, ate with local families in their homes and immersed ourselves in the sights and sounds of Rajasthan.